A common question I hear a lot with streaming revolves around which game would be "best" to play. The game being chosen translates to a lot of things, and ultimately helps define the identity of the product. Most large streamers will tell you that the key to finding a game to stream (and stream regularly) is to enjoy what you’re playing. That's obviously true - the key to growing your stream is consistency, and being able to have fun in the early stages is paramount. However, there's merit in discussing the factors that tend to contribute to larger games gaining mass appeal — this column isn't to say that you should immediately choose one of these titles, but try to work it into your perfect Venn Diagram of a stream game. I try to narrow down a couple different factors that I want all to align for me; this is what I've found. 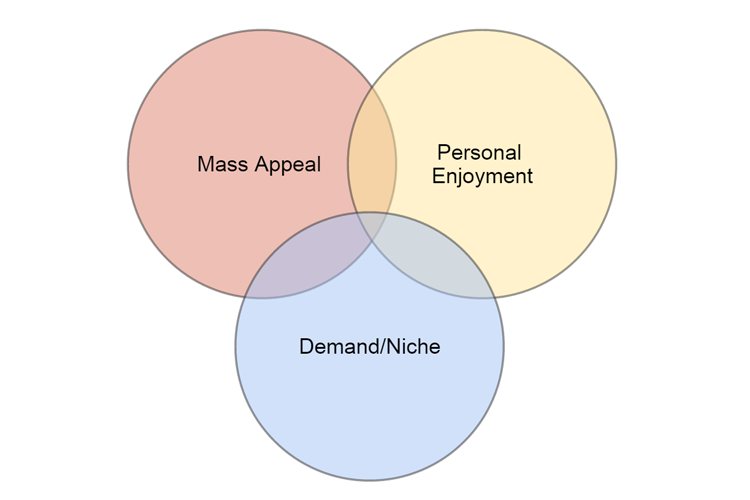 As you can see, there's three factors that I believe work into a "good" stream game (and keep in mind this is subjective): mass appeal, demand, and personal enjoyment. Ideally, you'd like to find something that fits into the overlap in the center, but that isn't required, as you can make concessions and find mid-way points as needed if you're willing to make the sacrifice. Personal enjoyment is fairly self-explanatory, as you need to be able to play the game for a long time without getting tired of it. It needs to be something that you feel isn't a huge chore; while grinding any game can get like that after a while, you have to be able to have the base fun that allows for you to offset fatigue with other things, like stream interaction. 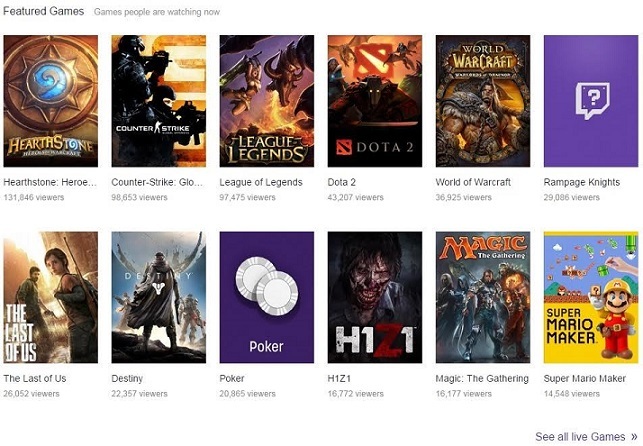 Some titles, like Super Mario Maker or Rampage Knights, represent new releases, or one large streamer playing a game. However, the others have a number of qualities that they share. User or randomly-generated content: Ever wonder why Minecraft is so nuts on YouTube? The ability to discover new mods and try out themed playthroughs means new content with new twists every time. This extends to games that have randomly-generated maps, monsters and loot, like Diablo III, Binding of Isaac, Spelunky or survival games like ARK: Survival Evolved. Viewers are treated to a promise that content is going to be unique every time, and they will be able to react to that randomness with the rest of the chat and their community in real time. Gambling: We're seeing a number of different mobile games experiment with this model, but the "gamble" of opening cases, chests or caches has been made extremely popular with Counter-Strike: Global Offensive and the associated raffling/"jackpot" secondary industry. Turns out, people love gambling without risking any of their own resources, and sometimes the schadenfreude of seeing someone else suffer a loss is just as satisfying as seeing them get a huge payoff. Obviously this remains up to the streamer to know their limits and how much they're willing to put up. Developers are becoming aware of this positive feedback, and building more pseudo-gambling mechanics into their games to both serve the players and spectators with hits of dopamine. Common examples include card pack opening in Hearthstone: Heroes of Warcraft and "Ultimate Team" pack openings in FIFA, Madden and other sports titles; the tense moments before the payoff can be got through in-game achievement or by paying for packs. The caveat with these streams is sometimes they become less about the game being played and more about the act of gambling. Remember that it's highly unlikely that you'll be able to make a huge stream following just by dumping a bunch of money into cases, because your stream is all about producing epic moments, and the house will likely always win. Nostalgia: These games have an inherent value to a lot of people due to them being "classics." This doesn't just apply to things like Super Mario 64, or Ocarina of Time: every game that has had a reasonably big audience can qualify for nostalgia points, and seeing it played in a different way can open a lot of eyes. Judging demand is the ability to give people a reason to watch your stream and become involved with your community. You want people to become invested in your stream, and feel like they're a part of something. Look at your stream as a service: always constantly look to create value for people watching. - Are they really good at the game they play? If so, do they explain it well, or is that greatness just entertaining to watch? - Are they reliably entertaining? - Are they doing something unique? - Do they have a secondary talent, like cosplay, contests, giveaways? Essentially, you need to ask yourself a tough question: "why would people want to stick around my stream?" Also, you need to consider how easily your value can be replicated by other people. This is why pro eSports players or speedrunners often have a built-in value that makes starting up streaming simpler: their experience is not easily copied without a large time commitment that not everyone has the dedication for. It's also what makes case-opening streams hard to start up: there are people who do it better, and without some extreme creativity it will be unlikely that you can replicate it to a degree that will pull loyalists away. In the same vein, if you're trying to break into a huge game (say, League of Legends), you will have much more competition than something niche. It all comes back to the original point: you should be streaming a game because you enjoy it. However, being cognisant of the factors that some games bigger than others will help you find a sweet spot. Good writers do a lot of reading, and good streamers should do a lot of watching; even if it isn't to your taste, examining what makes successful streamers successful from an outside perspective will help inform your decisions and help you grow your community. Matt Demers writes about video games and streams them on Twitch. You can follow him on Twitter.